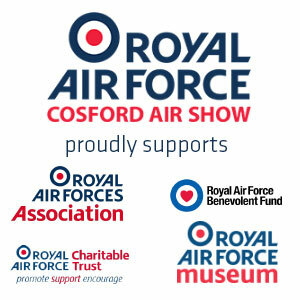 The RAF Cosford Air Show offers unparalleled potential for your organisation to engage with over 50,000 visitors at the Royal Air Force’s only Air Show. Our sponsors range from key players in the defence industry, international consumer brands, higher education providers and local business. Choose from an exciting range of sponsorship packages or let us create an exclusive package, designed specifically to achieve your company objectives. Examples of existing packages include Aircrew Hosting, Public Information, Vintage Village and Souvenir Programme. Our STEM Hangar is an exciting and inspiring environment where the engineers of tomorrow get the opportunity to meet the engineers of today. It provides the ideal venue to showcase your company’s technical achievements and commitment to promoting Science, Technology, Engineering & Mathematics. The STEM package is one of the most popular packages that we have available offering premium exhibition space, with an excellent mix of additional promotional opportunities including content and advertising in the Souvenir Programme, VIP hospitality and branding sites. Advertising space is available in the full-colour official Air Show Souvenir Programme. This exclusive, high-quality souvenir provides a unique opportunity for your company to reach a wide and affluent audience. In addition to sales on the showground, the programme is distributed free of charge to all our hospitality enclosures. Contact us for a rate card. Banner advertisement sites are a simple, yet extremely effective way to display your company’s brand to our visitors during the Air Show. We have a number of options available, to suit all budgets and target audiences with various locations across the showground, entrance and exit points and areas of high VIP footfall.